I live in a quiet neighborhood in an even quieter cul-de-sac. It’s quite a sought after street. Until recently I thought that I was the street weirdo. You know, the one that the neighborhood kids stay away from. I see myself as the Boo Radley of our street. To be honest I quite like being the local weirdo. Anyone who has read my book I SPIDER would know that weirdo is a title I deserve and a badge I wear with some honor. But recently I’ve come up against some stiff opposition and even though it frightens me to say so, I may not be the oddest person living in our street. There’s been a few small incidents. An eighteen year old bloke sneaked up to our house at 1 in the morning and cut my garden hose. My bedroom window overlooks the front yard so I watched the whole thing. I put it down to teenage shenanigans. There’s the murder house in the street where a man killed his gay lover. In another house a father of two overdosed and died. And there’s a home with fifteen foster children all in different stages of psychosis. (Apparently the couple who own the house make a small fortune for each child they house.) This is all in a street with only twenty houses. I’m most worried though by a fellow who not only takes my title of street weirdo, but he makes me appear sane, he also makes me worry for the safety of my five and ten year old daughters. (He’s good at being weird). King Weirdo was first brought to my attention by one of my next door neighbors. She was worried; he and his bulldog had been checking out every house in our street, entering peoples front yards and looking over fences. She spent the whole day watching him. King weirdo returned the next day and this time I watched him and his dog checking out the houses… including my house. My wife called the Police, they never turned up. It turns out that he lives in our street, in the house at the very end of the cul-de-sac. Perhaps he was just walking his dog. Over the past six months The King has turned up on many occasions. His dog is generally off the lead and it’s often sniffing around my front door, while he’s standing right beside it, my door is 25 meters from the road. My presence doesn’t seem to bother him, he just puts the dog back on the lead and leaves. I’ve watched him walking around the front yard of the house across the street on at least five occasions. 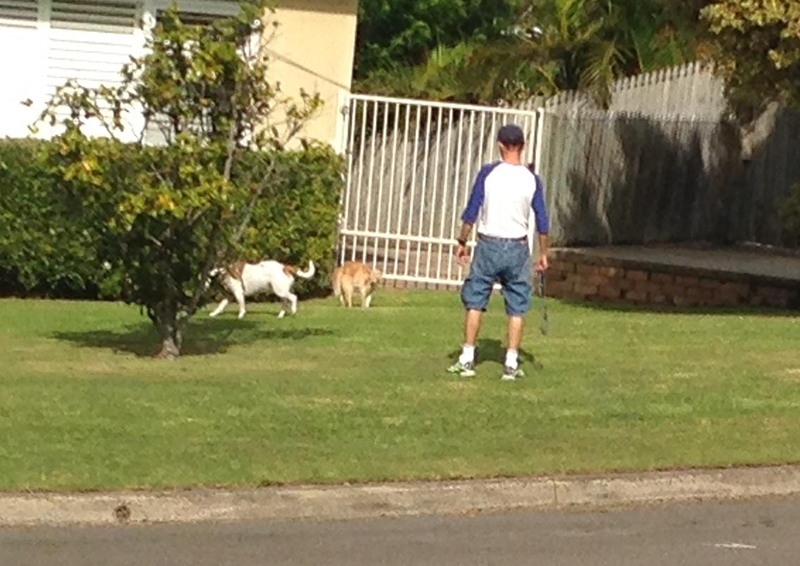 One time he had parked his car in front of their driveway and was walking up and down with his dog off the leash. I opened my Venetian blinds loudly and caught his attention. He simply put the dog back on the leash, got back in his car and left. Two days later the woman from across the road came over to say that her cat hadn’t come home for 48 hours. She also told me that King weirdo was seen by another neighbor sicking his dog onto her cat. IT NOW ALL MADE SENSE. The day he was parked in their driveway I saw the cat desperately trying to escape over the fence. All the times he was sitting on the grass outside of my place he was goading the dog to attack the neighbors cat. The neighbors cat mysteriously reappeared as did King weirdo. King turned up with his dog. I was there watching him so he quickly put it back on the leash. I was standing at the window when ten minutes later his dog burst around the corner on a long leash. 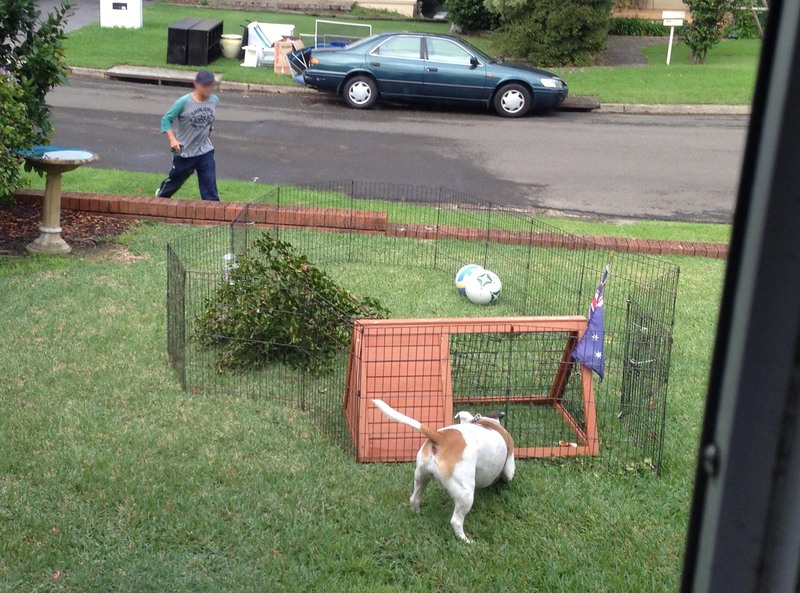 He held the leash as the dog tried to force its way into the rabbit cage. He saw me and left. Next day same thing. This time the dog wasn’t on a leash. This time I took photos. We reported him to council. They said that they’d patrol the area. I never saw them. He didn’t return for a couple of days after he saw me taking photos, but he did return. Now I’m a fairly big bloke. I’m 110 kg surfer with the scowl of a professional neighborhood weirdo. I couldn’t believe how little shame the guy has. He just looks at me with a smug smile and a pathetic sorry guvner nod of his head. “I’m going to find it really hard not to confront him if he comes back.” I said to my wife. “Don’t you do anything.” She said. Sure enough he came back and of course I confronted him. “The man with the dog is back.” My daughter screamed. 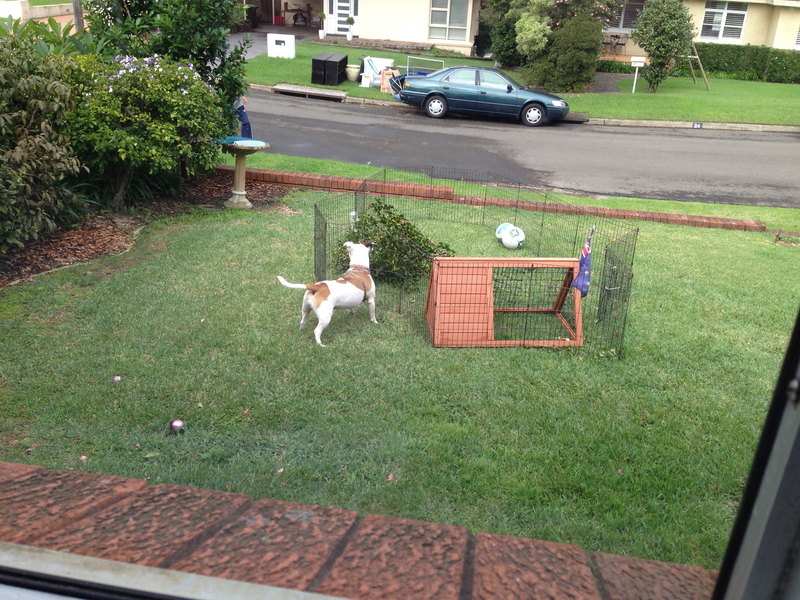 I watched as the dog without a leash honed in on where the rabbit used to be. Then it continued on up the side of my house where King pretended to put the lead on his dog, while all the time looking over the back fence for the rabbit. He had the dog back on the lead, then he saw the cat across the road, so he let the dog off the leash. They ran across the street and cornered the cat, with King weirdo on one side and the dog on the other. While King egged his dog on the cat arched its back and spat. But the dog had its chase and it wasn’t really interested in the cat. I think it has quite a gentle nature. Once again he put the lead back on his dog. Through all of this I bit my tongue and took photos with my iPhone. But King still hadn’t had enough. With a patented sneer on his face he headed back towards my back yard and the rabbit. The dog headed straight past my front door, the door I burst out of yelling. The other fathers in the street probably would have handled it more diplomatically. They have jobs like High School Teacher and Banker. They would have been very calm. I instead had steam coming out of my ears and bile coming out of my mouth. Both the dog and his master stopped and stared at me. King bent down to put the leash back on his dog. “I’m not doing anything.” He said. For some unknown reason I was repeating everything. As I watched King scurry back to the house at the end of the cul-de-sac I noticed that a couple of the neighborhood kids stood opened mouthed, they had witnessed the whole thing. Once again my wife contacted both the Police and the Council. Council said that if he is training his dog to attack, it’s a police problem. If he trespasses again and I take photos the Police might do something. So my throne is looking decidedly shaky. I fear that my title of street weirdo belongs to another.